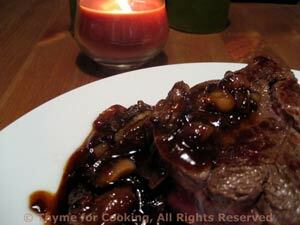 Steak, Shallot, Red Wine Reduction, Thyme for Cooking gourmet main course. Heat oil in a nonstick skillet over medium-low heat. Add shallots and sauté until starting to brown and caramelize, about 15 minutes. Remove shallots to a plate and cover to keep warm. Increase heat to medium-high and add steak. Quickly cook steaks for 2 - 4 minutes per side depending on type and thickness. When done, remove and cover to keep warm. Add red wine to pan and scrape up all the yummy brown bits on the bottom. Add the shallots, sugar and vinegar. Cook, stirring over high heat, until sauce is reduced and starting to thicken, 3 - 4 minutes. Spoon a bit over the each steak and serve.